I haven't been using brushes to apply my makeup since very long. Not so long ago all I needed was some lipgloss, mascara and eyeliner. Now brushes are essential to me. I've not known the makeup brand BH Cosmetics since long either. I've discovered it via a picture posted on Kosmetik4less Facebook page. 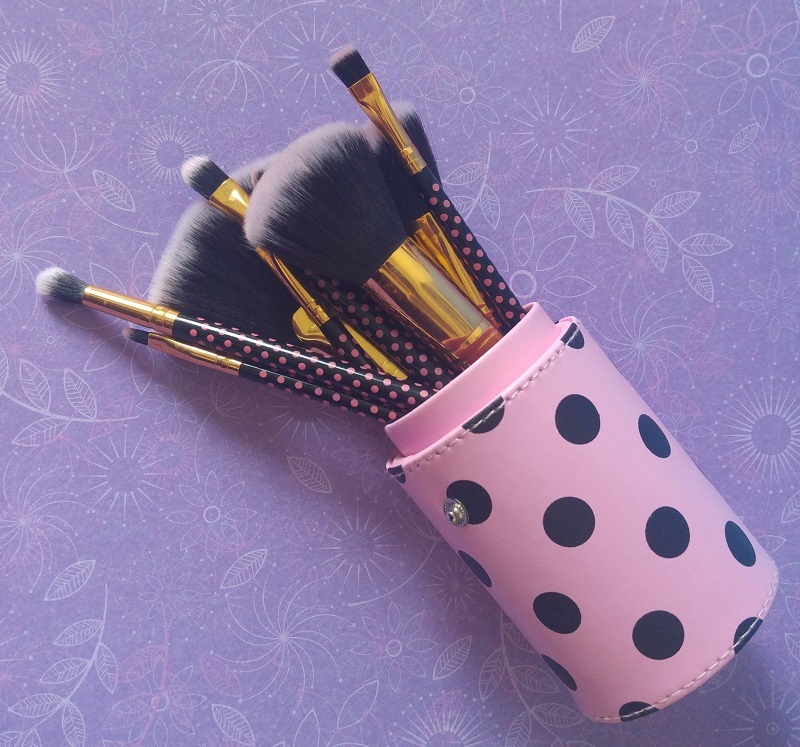 You see, Google is your friend so I looked for swatches and reviews of their products and as soon as they had a big brush sale I jumped into it and bought the Pink-a-Dot brush set (as well as two others but that's not the question). Right now the price of this set on the official BH Cosmetics website is $19 which is really cheap compared to Zoeva brushes or sets for instance. 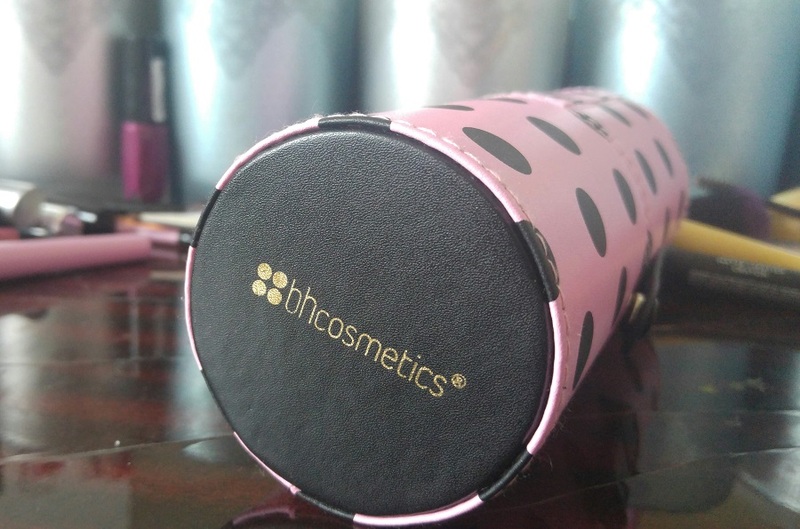 This one has 11 brushes contained in a pink cylindrical hard case with black dots. The case itself is really sturdy and you know that your brushes are safe if you're taking them away from home in this case. 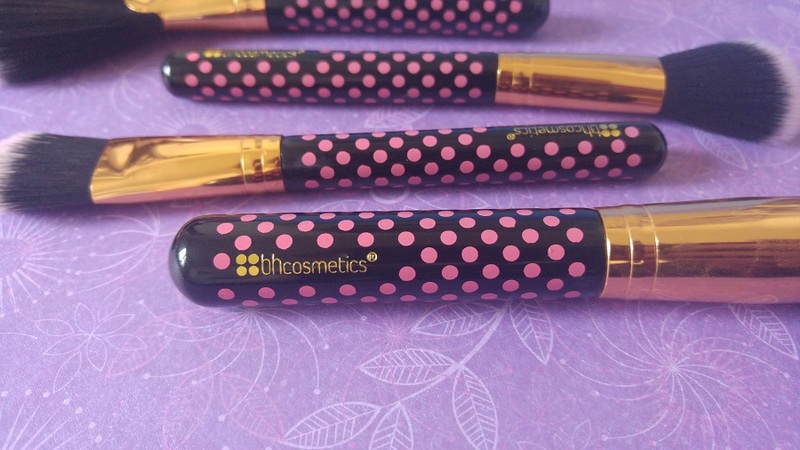 Each brush has a black handle with pink dots and a golden ring holding the hairs of the brush. The name of the brand is engraved in the handle in gold too. It's cute and girly in a nutshell. 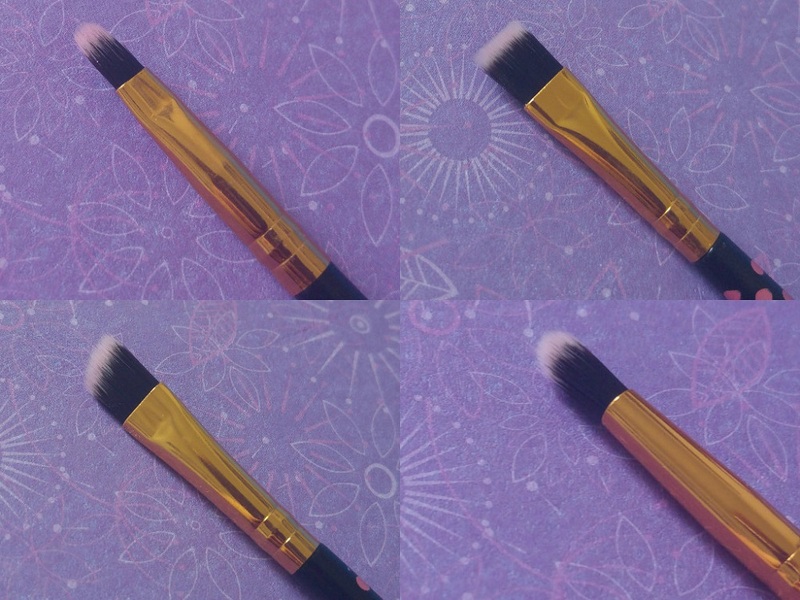 In this set, there are 4 brushes for the face and 7 are aimed a applying lip and eye makeup. 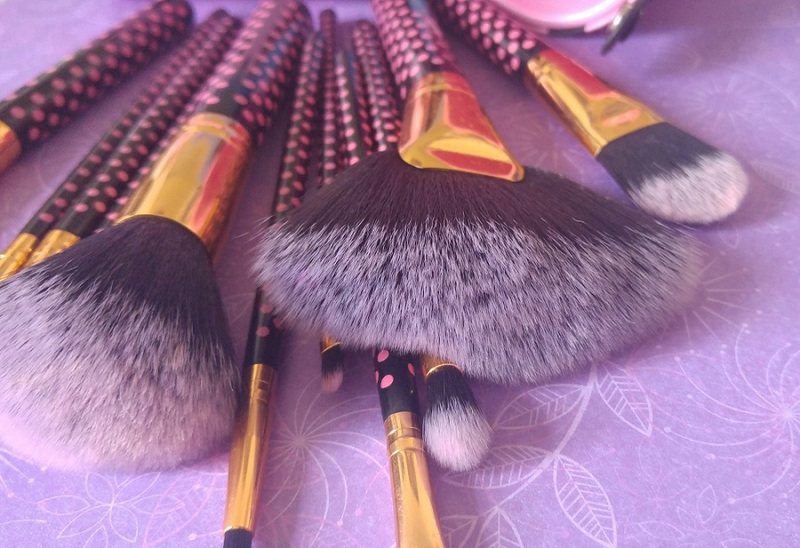 The first brush is a bonus deluxe fan brush that's actually very fluffy and lovely to use. It's really soft. The second one is a classic foundation brush that I have no use of. I do not wear any foundation but I sometimes use it for my eye makeup when I'm running short of clean brushes. I really like the two last brushes : a blush brush and a powder brush. 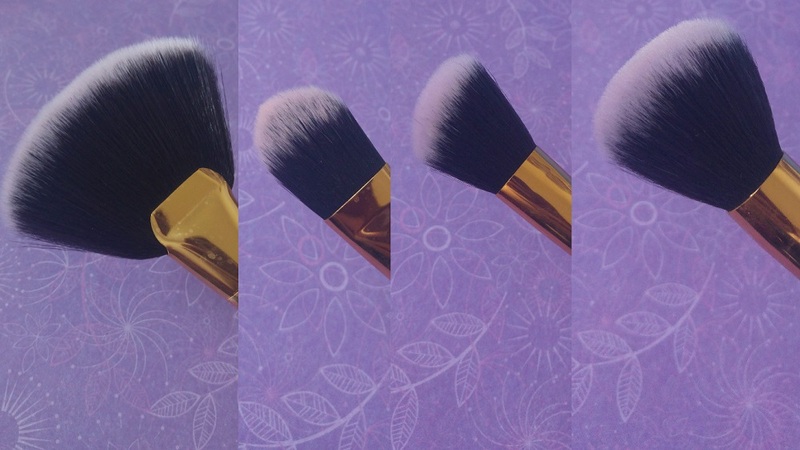 The blush brush is precise and fluffy enough to be able to vaguely blend the blush. 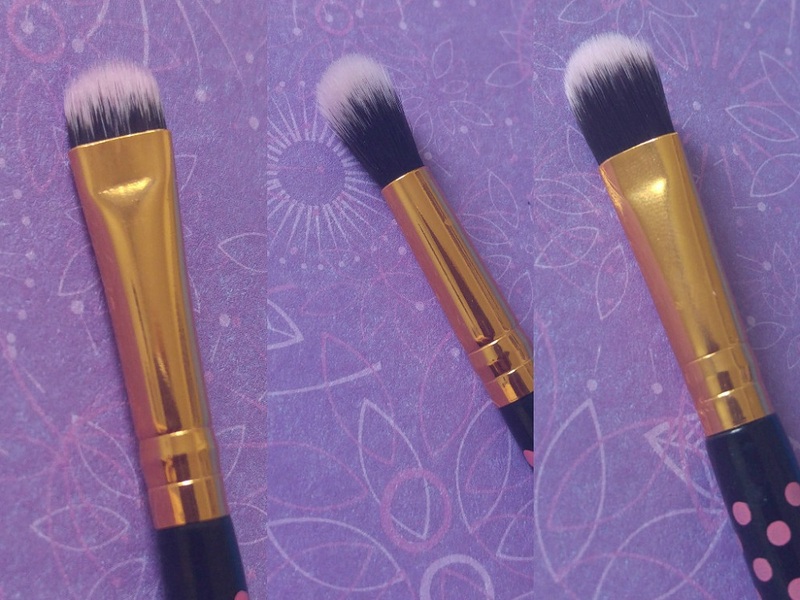 The powder brush is also large and fluffly and it's quick and easy to work with this one. It's really simple : six out of the seven brushes are to be used for eye makeup. The first three ones are a small smudge brush that I like using for the inner corner of my eyes, a very efficient blender brush and a classic eyeshadow brush that I'm not fond of. I actually like teeny tiny eyeshadow brushes more than bigger ones. The first brush at the top left corner is a lip brush that I sometimes use as an eyeliner brush because it's really precise and thin. To its right, there's a flat eyeliner brush I don't really care about unless it is to apply eyeshadow to the lower lashline. Other than that I find it hard to apply eyeliner with this kind of brush. At the bottom corner there's an angled eyeshadow brush that I use to apply eyeshadow in the crease that I will then blend with the blender brush we've just seen above. That is one of the brushes I use to create an eyeliner stroke. For that I can also use its neighbor, a tapered eyeliner brush that's one of my favorite brushes. I can also use that one to apply a bright light eyeshadow in the inner corner of my eye. All of them are synthetic, vegan and cruelty-free as are all of BH Cosmetics cosmetics. I've had them for several months now and some are my go-to brushes. They're very soft and don't lose their hair even after being washed many times. You know how it's common knowledge that no matter how expensive your makeup it, you won't achieve any spectacular look with useless tools ? We're there. My makeup looks are more professional looking be the makeup cream or powder. The quality is really amazing for the price, great value ! Approved and recommended ! Have you ever tried out BH Cosmetics brushes and makeup ? What do you think of them ? Anything to advise me to try out too ?